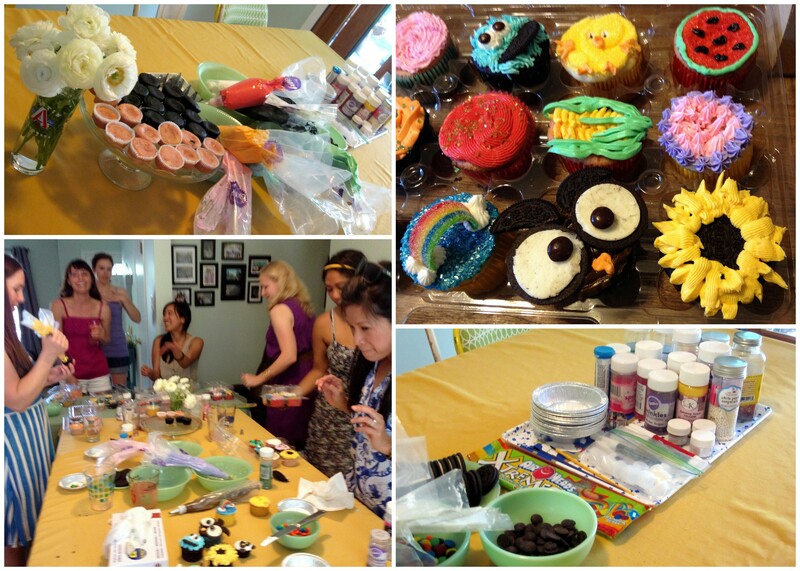 Last Sunday, a dozen or so of my lady friends came over for a cupcake party. 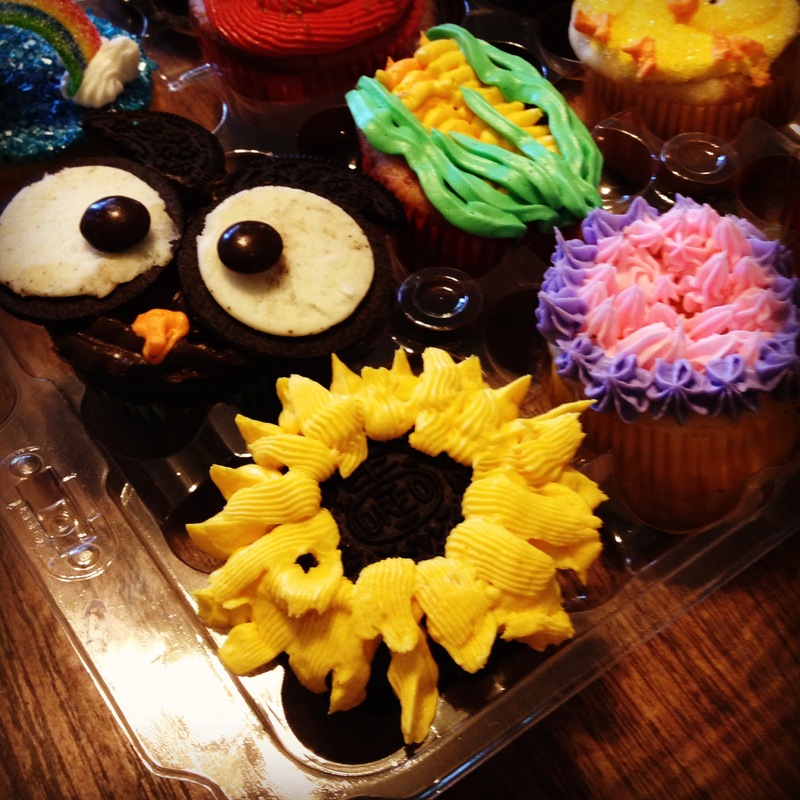 There was cupcake-shaped food, Cupcake wine, and lots of cupcakes for decorating. It was a lovely afternoon of hanging out on the deck and food crafts. Decor: I kept decor simple with a cupcake banner against a backdrop of doilies, a chalkboard welcome sign, two small springy floral arrangements, and yellow, green, and white as the colors (mainly because it matches my dishware). Meatloaf cupcakes from Six Sisters’ Stuff – I used Costco mashed potatoes to cut down on time but still ended up behind due to some microwave power issues. They were still tasty without the green onions and bacon bits. I doubled the recipe but had enough filling leftover for at least another four to six meatloaf cupcakes. Caesar salad cups – I used Giada’s directions for the Parmesan cups but filled them with Costco Caesar salad mix. Mini mushroom and leek pies from iVillage – Instead of chicken, I doubled up on the mushrooms with baby bellas and white mushrooms. This was tasty, but the yum factor did not align with the amount of effort it took. Brie and apricot jam cups – I try to include brie at every party because I absolutely love it but can’t justify buying it just for myself. 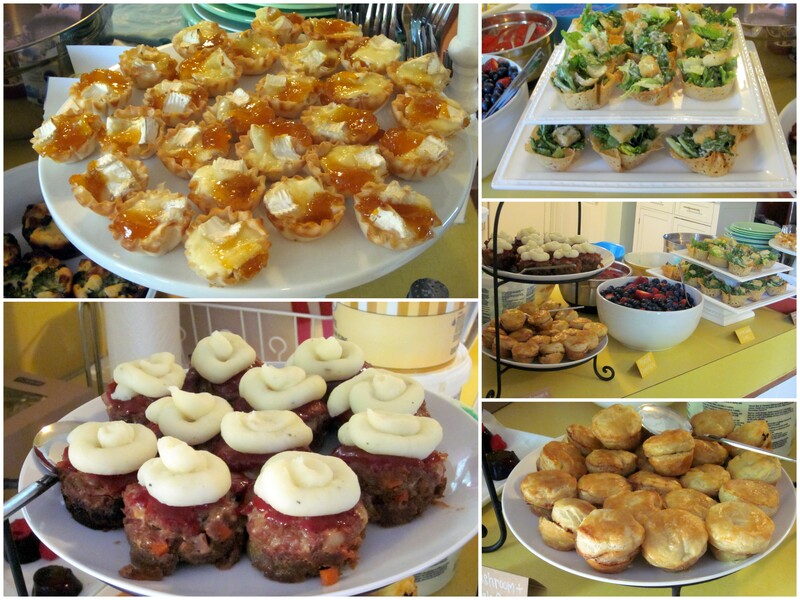 I used the pre-made mini fillo shells, added brie and apricot jam, and baked for 10 minutes–easiest appetizer ever! Fruit mix of mango, strawberries, and blueberries. Chicken broccoli cheese cups brought by a friend. Raspberry wine jello shots brought by a friend. Fruit punch from Country Living – this was super easy with just five ingredients: cranberry juice, lemon juice, ginger ale, sugar, and sparking wine (I left this as an optional top-off). We went through four batches of it, and I got great compliments on it–highly recommend. Other drink options: sparkling water, hot tea, beer, and more wine brought by friends–although most ladies just drank the punch. There were 10 colors of frosting, tons of sprinkles, disco dust/edible glitter, edible ink markers, chocolate chips, M&Ms, oreos, and sour belts for decorating. The decorating portion of the afternoon was a little chaotic. We had some bagging issues, I didn’t have time to make samples ahead of time like originally planned, and it was a bit crowded at the table, but everyone seemed to enjoy themselves. I sent the ladies off with goody bags for cupcake decorating at home. Each goody bag had two test tubes of sprinkles, two piping bags, 24 baking cups, 4-5 pastry tips, and a coupler. The sprinkles looked so pretty in the tubes (I got the test tubes years ago from Amazon when they were only about $4 for 10). I can’t wait to see what else people come up with! This entry was posted in Crafts, Decorations, Food and tagged cupcake food, Cupcake party, doily backdrop, easy punch, ladies brunch, meatloaf cupcakes. Bookmark the permalink. Cute idea! Looks like a fun party! !